The first generation Chevrolet Corvette; C1, was introduced in late 1953 and produced until 1962. This "solid axle" generation ended with the introduction of the Sting Ray in 1963 with independent rear suspension. 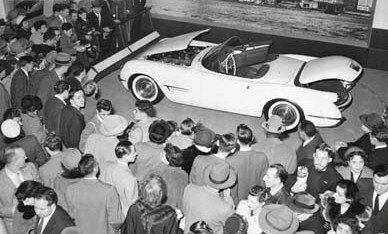 As the story goes the C2 prototype had mixed reviews and sales lagged. 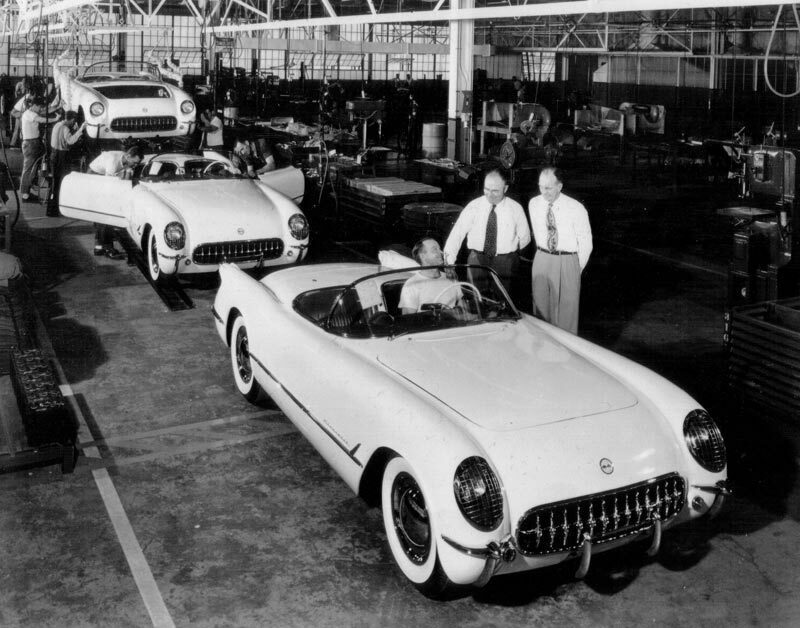 The corvette generation was nearly cancelled but thanks to Harley Earl stayed in course and Corvette came into its own, both on the road and at the racetrack during the space-age Sixties. It flexed its muscle during the subsequently turbulent years of anti-war protests, political scandals, and civil unrest. It survived an onslaught of adversity throughout the Seventies. And while it welcomed the eighties with its portfolio secure, the car's fortunes plummeted over the course of the ensuing decade. 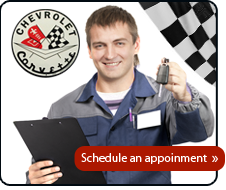 Again turning the tide, Chevy's legendary sports car was reborn in the late nineties as a technologically advanced performance machine for the new millennium and it enjoyed a well-earned resurgence in popularity. Then, the Corvette engineers unleashed the C6, the most precise and refined Corvette yet. They soon topped themselves with the next-generation Z06, a 500-horsepower track-bred Corvette that upped performance to new heights. 1970 17,316 $5,192 First year for the LT-1 Small-Block and 454 in? Big-Block; three-speed manual transmission dropped and four-speed manual became standard with Turbo Hydra-matic available as no-cost option with all engines except LT-1 350; posi-traction made standard equipment; introduced along with all-new second-generation Chevrolet Camaroon Feb. 26, 1970, new egg-grate metal front grills and fender grills, lower molded fender flares, new hi-back seats & interior trim, new custom interior option includes:leather seat trim, cut-pile carpeting, lower-carpeted door panels & wood-grain accents. 1971 21,801 $5,496 Significant horsepower drops due to reduced compression ratios to meet GM corporate edict requiring all engines to run low-octane unleaded gasoline; horsepower ratings based on both "gross" and "net" figures with the former based on engine hooked to dynometer while "net" ratings based on horsepower as installed in vehicle with accessories and emission controls installed. 1972 27,004 $5,533 Horsepower ratings now advertised in SAE net figures, last year for LT-1 engine, front & rear chrome bumpers & removable rear window, last year for windshield wiper door. 1973 30,464 $5,561 5 mph front bumper system with urethane cover, pot-metal front grills (black with silver edges), chrome rear bumpers unchanged, new design front fender ducts, first year for radial tires (standard equipment), rubber body mounts, new hood with rear air induction & under-hood insulation, new front-end (round) emblem. 1974 37,502 $6,001 5 mph rear bumper system with urethane cover to match last year's front bumper, new recessed tail lamps and down-turned tail-pipes. 1974 is the only year with two piece rear bumper cover with center-split. No gas lid emblem was used. Aluminum front grills (all-black), new dual exhaust resonators, revised radiator cooling and interior a/c ducts, integrated seat /shoulder belts in Coupe. Last year for true dual exhaust, last year for big-block engine in a Corvette. 1975 38,645 $6,810 First year of Catalytic converter & single-exhaust, black (painted) bumper pads front & rear, redesigned inner-bumper systems & one-piece rear bumper cover, plastic front grills (all-black), amber parking lamp lenses (replaced clear lenses on 73-74) new emblems, last year of C3 convertible. 1976 46,558 $7,604 First-year for steel floor-panels, cold-air induction dropped, new aluminum alloy wheels option, new one-piece rear "Corvette" nameplate (replaces letters), last year of "Stingray" fender nameplates. 1977 49,213 $8,647 Black exterior available (last year-1969), new design ""Corvette flags" front end & fender emblems. New interior console and gauges, universal GM radios. 1978 46,776 $9,750 New fastback rear window, Silver Anniversary and Indy 500 Pace Car special editions; Pace-car included sport seats & spoilers-front & rear, limited option-glass t-tops; redesigned interior, dash and instruments. 1979 53,807 $10,220 Sport seats (from previous year pace-car); front & rear spoilers optional, glass t-tops optional; New interior comfort features; highest Corvette sales year to date. 1981 40,606 $16,258 Production is switched from St. Louis to new Bowling Green plant; 350 V8 returns in California cars, last year for manual transmission. 1982 25,407 $18,290 New cross-fire fuel-injected L83, New automatic overdrive transmission; Collectors Edition features exclusive hatch rear window - is one fourth of production.